Mind slide written by Glenn Bullion. A random act of nature changed Mason's life forever. He lost his parents on that fateful day, even his memories of them. But he gained something in return. Mason has the ability to "mind slide", the ability to project his consciousness. He can be anywhere in the world. Watching. Listening. Despite being raised in a government lab, Mason has put a life together for himself. He uses his ability to work as a private investigator, specializing in missing children. He even has a crush on a woman. Kelly tries to put that terrible night behind her. Kidnapped when she was a teenager, she still struggles to overcome the trauma. The details of her rescue were always a little sketchy. It was almost as if someone knew exactly where to find her. Mason is unlike any man she's ever met. To her surprise, she finds herself caring about him more than she ever thought possible. But he has secrets. Now someone is following them both, and he wants those secrets. The story is about Mason, who has a special power. He has the ability to project himself to any location in the world, as long as he has an address or a specific person in mind. He can't physically touch anyone, or be seen when he mind slides, and in all intensive purposes he's basically a ghost. His power is first discovered when he's 7 yrs old, just shortly after the death of his parents. As you can imagine a power like that would not go unheeded and he's sent to a mental clinic where he spends 11 yrs of his time as a lab rat. It's on his 18th birthday when he's finally allowed out. The story is mainly told from Mason POV, but it does alternate to Kelly, his love interest. She's the daughter of one of the scientist that experimented on him and it was interesting to see how their relationship unfolded. 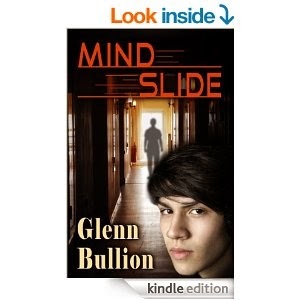 One of the main reasons why I liked Mind Slide so much was because of the characters. They're all defined in one way or the other, and Mason is a character that I could relate to and immensely liked. He doesn't act like a typical hero; he's not pretentious, but a simple man doing what's right. Another reason is the storyline. It's not cluttered and made complicated just for the sake of it. It's a clean, straightforward story that flows smoothly. I'm not saying it's plain or boring but rather it's genuine - you get what you pay for. Hero + special power + love interest + conflict + resolution = Glenn Buillion book. I could have easily reviewed any of his other books, but I've decided to go with my favourite one. If you're looking for something original and different from the norm then this book probably won't evoke the same joy that I experienced. For me, some of the best books I've read are the well trodden ones, but done exceptionally well. At about 200 odd pages it's not the longest and the pages do fly-by. It's definitely a book to read for a lazy weekend. Finally, if you're an urban fantasy fan and haven't read a Glenn Bullion book then I implore you to give him a go.